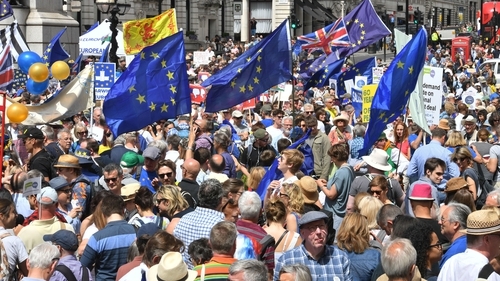 Around 100,000 supporters of the European Union marched through central London to demand that the British government hold a final public vote on the terms of Brexit, organisers have said. Protesters packed the main arteries of the capital, waving British, Irish and European flags and colourful banners to call for a "People's Vote" on the eventual deal in which Britain leaves the world's biggest trading bloc. On the second anniversary of the Brexit vote, polls show political divisions are entrenched. Despite some confusion over what Brexit will actually mean there has been no clear change of heart. The "People's Vote" campaign, which includes several pro-EU groups, is campaigning for a public ballot "so that we can decide if a decision that will affect our lives for generations makes the country better or worse off". Neither of Britain's two main political parties back the idea of holding a referendum on the final deal. "People have seen politicians making a cataclysmic mess of a really bad deal they didn't vote for, or even a no deal they didn't vote for," a campaign spokesman said. "This is the people telling the political elite that they got it wrong." A Survation poll earlier this week found that 48% of respondents supported a referendum on the final deal, while 25% were opposed. As of yet there is no certainty about what the final deal could look like, amid infighting in Prime Minister Theresa May's Conservative government as well as among some of its opponents about what they want from Britain's new trading ties with the EU after it leaves in March next year. The march comes as UK International Trade Secretary Liam Fox has said Mrs May is "not bluffing" about being prepared to walk away from talks with Brussels, as cabinet colleague Boris Johnson urged her to deliver a "full British Brexit". Liam fox said: "The economic impact on a number of European countries would be severe"
Mr Fox said the economic impact of a "no-deal" Brexit on EU members would be "severe". Meanwhile, Mr Johnson said people would not tolerate a "bog roll Brexit" that was "soft, yielding and seemingly infinitely long". The Brexiteer cabinet ministers' messages came as pro-EU marchers prepared to take to the streets to call for a referendum on the terms of Brexit secured by Mrs May, two years on from the public's decision to leave the bloc. Mr Fox told the BBC: "The Prime Minister has always said that nothing is agreed until everything is agreed and that no deal would be better than a bad deal, and I think it's essential as we enter the next phase of the negotiations that the EU understands that and believes it." "Countries like Ireland, countries like the Netherlands, countries like Belgium, would really feel the impact of that and that cannot be what the European Union 27 actually want to see," he said, adding: "I think our negotiating partners would not be wise if they believed that the Prime Minister was bluffing." His comments in an interview to mark two years since the British people voted to leave the European Union were recorded before Airbus warned it could be forced to pull out of the UK if there was a "no deal" Brexit. Katherine Bennett, Airbus' senior vice president in the UK, told the Press Association: "We don't deal in idle threats. We seriously believe a no-deal Brexit would be catastrophic." "Across the country I find people who - whatever they voted two years ago - just want us to get on and do it," he said. He added: "They don't want a half-hearted Brexit. They don't want some sort of hopeless compromise, some perpetual push-me-pull-you arrangement in which we stay half-in and half-out in a political no man's land - with no more ministers round the table in Brussels and yet forced to obey EU laws. "They don't want some bog roll Brexit, soft, yielding and seemingly infinitely long," he said.